Previously – we made South Dakota angry. We got almost, ummmm, 3 angry letters . . .
We built out a master spreadsheet – we ranked the states based on huntable land, number of hunters, waterfowl harvest, ducks per hunter, geese per hunter . . . Then we added in what we termed “star” ducks or geese – meaning, that state is THE location for a species – there were bonus points weighing these species to slant those states (i.e. King Eider and Harlequin in Alaska) higher in the rankings. Finally, there were the intangibles – those states that just didn’t seem right in their rankings, based on history or legacy or some other intangible . . .
On to the top 10 . . .
Want to write hate mail about this ranking? Bring it on. 5th generation Floridian behind the keyboard. How the hell does Florida get bumped up? Simple. Florida is THE best place in the US to harvest a Black Bellied Whistling duck. THE best place to take a Fulvous Whistling Duck. One of THE only places to kill a Mottled duck. And, due to it’s low longitudinal location, it provides a top destination for trophy plumed bluewings, green wings, redheads, pintails, and wigeon. In other words, don’t sleep on the Sunshine State! I’ve duck hunted a LOT of these states. Washington has not been one of them. I was honestly shocked that it came in as high as it did in the rankings. Besides being the only state in the lower 48 to allow Harlequin harvest (albeit 1 a day), Washington has a healthy, mild climate that lends itself to waterfowl. Michigan’s proximity to the Great Lakes and Canada has no better payoff than duck season. One of the premier spots in the US for Oldsquaw, Eider, Scaup, and Canvasback, plus plenty of puddlers making their way down the Mississippi . . .
Can “the Location of Habitat Flats” be an intangible category? Because, I know #7 isn’t something to sneeze at, but watching some of Tony Vandemore’s videos makes it hard for me to believe there are 6 states still to come. Mallards galore. Greenwings and Bluewings and Pintails. Geese for days. And this doesn’t even scratch the surface of the conservation light goose season. North Dakota is a premier destination for the waterfowler. The seat of the Prairie Pothole region for the US, these are not your father’s greenheads . . . These are fat, cornfed mallards, 4 pounders that “thud” when they hit the ground. A North Dakota field hunt or stream bottom hunt should be on every waterfowler’s bucket list. It is something to be experienced, at least once . . . The headwaters of the Mississippi, the Land of Lakes lives up to its descriptive nickname. Top of the flyway doesn’t always result in the best of plumage, but for sheer volume of ducks, Minnesota is hard to beat. The first time I crossed the Mississippi into Arkansas, it was like the Chamber of Commerce had scheduled some sort of waterfowl show. It was hours before a front passed through, and as soon as we hit the state line, there were ducks and geese everywhere. I know that was “right place, right time” but it offers an interesting glimpse into Arkansas as a destination. Rice, soybeans, and flooded timber make this arguably the premier destination for waterfowl in the lower 48. Specklebellies, light geese and Canadas all add to the bag. Sure, the number of hunters has increased every year, but Bayou Meto is still a legendary locale in waterfowling lore. I’ve always thought of Texas as a solid waterfowling state, but never did I imagine it would end up as high in our rankings as it did. Plenty of geese dot the massive state – specks, snows, Ross’, and Canadas. Every species of duck imaginable is harvested each year, and the diver pods along the coastline are something to behold as they buzz, 300 in a group, into your spread 2 minutes after shoot time. California is here based on sheer numbers. It is a premier state for Mallard, Wigeon, and Pintails. It offers great goose gunning up and down the state. And it is THE place in the lower 48 to harvest the Cinnamon teal. A California waterfowl hunt is a must for the serious waterfowler, and is not to be missed. We’re here. How does Louisiana beat out the likes of Texas, California, and even it’s neighbor to the north, Arkansas? For the data we had access to, Louisiana ranked first in number of ducks harvested, overall waterfowl harvest, ducks per hunter, and is a premier destination for trophy waterfowl due to it’s low southern geography. This equals full crescents on Bluewinged teal, Bright green on Greenwings, lit up Redheads, plenty of water for tuxedo’d Ringnecks, timber full of greenheads and woodies, enough pintails and canvasbacks and stray mottleds and Blacks to make Louisiana, well, a Sportsman’s Paradise! 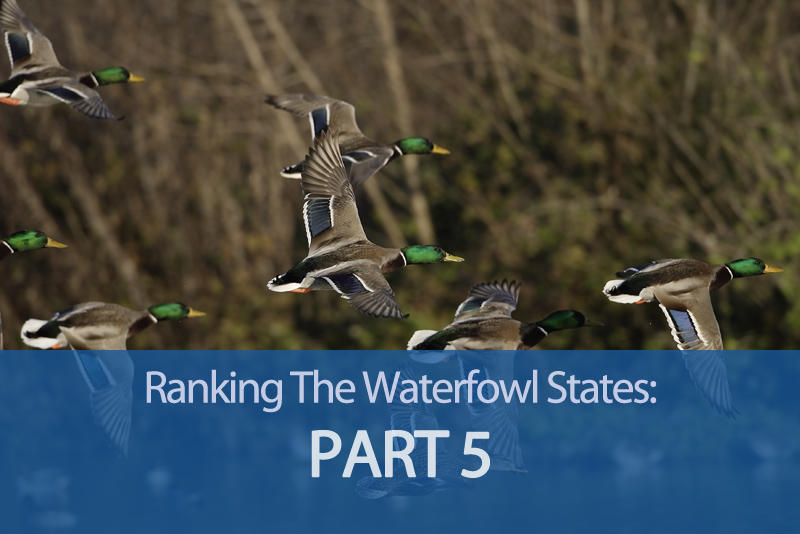 There you have it . . .Huntfowl.com’s first ever ranking of states for waterfowl . . . If you’ve been thinking of booking a trip to one of these destinations, don’t wait any longer . . . The season is almost here . . .